Art and Music on Rogers Ave! 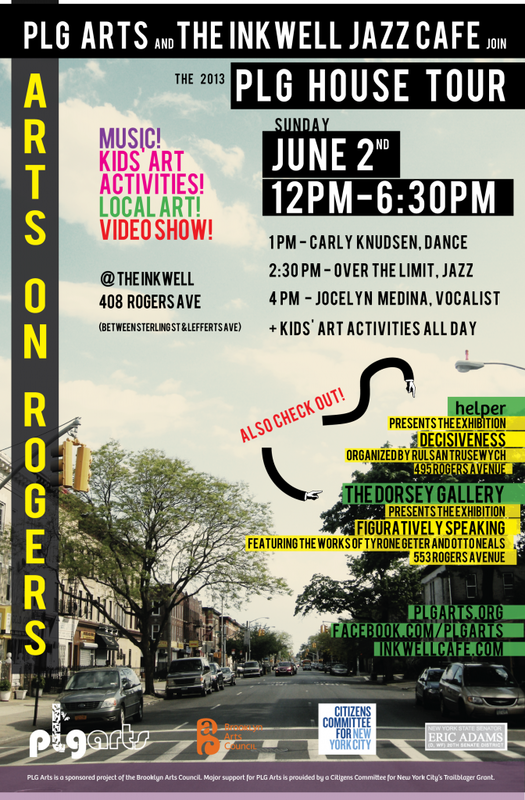 ART & MUSIC on Rogers Ave. This Sunday, June 2nd, as part of the Prospect Lefferts Gardens House & Garden Tour join in the fun on Rogers Avenue. Figuratively Speaking, an art exhibition featuring the works of Tyrone Geter and Otto Neals.Noon–6PM. The Dorsey Art Gallery, established in 1970 by the late Lawrence Peter Dorsey, is the oldest, continuously active, black-owned art gallery in New York City. ‘Dance With the Stars’ at the Inkwell—lessons and performances for children and adults. Jocelyn Medina, vocals; Jamie Reynolds, keys; Zack Lober, bass. The sounds and styles of vocalist/composer (and PLG resident) Jocelyn Medina fuses elements of Brazil, Spain, Africa and India with jazz harmonies, funk grooves and adventurous improvisations. As a bandleader, she has toured throughout the U.S., Europe and South America.